Todd Terje & the Olsens made their US live debut at Coachella on Friday (4/10), turning the stage into a jungle-themed cocktail bar. 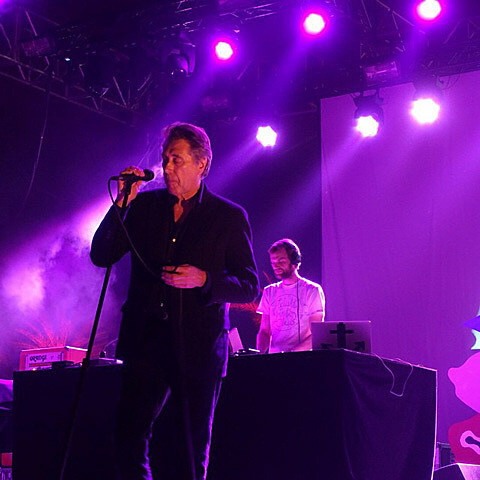 Their set offered up one of the weekend’s surprises: Bryan Ferry came out to sing on his and Todd’s cover of Robert Palmer’s “Johnny and Mary.” The set also included singles “Delorean Dynamite,” “Strandbar” and finished with “Inspector Norse” and a flock of dancers covered in Christmas lights. Video of “Johnny and Mary” and “Inspector Norse,” and the setlist, are below. Did anyone stay up to watch the live broadcast? Todd Terje & the Olsens will bring the party to NYC on July 21 at Terminal 5. Tickets are still available but if you’d like to go for free we’re giving away a pair. Details below. For a chance at winning a pair of tickets to see TODD TERJE at Terminal 5: either tweet something that includes both @BrooklynVegan AND “TODD TERJE at Terminal 5″ in the tweet, or send an email to BVCONTESTS@HOTMAIL.COM with the subject line “TODD TERJE at Terminal 5″. Include your first and last name in the email. We’ll pick a winner at random and contact them with more details. If you enter by email, it will not be shared with anyone else. Good luck!